A sad byproduct of divorce is that the parents of a non-custodial parent can lose contact with their grandchildren afterward. Unless they maintain a good relationship with the custodial parent post-divorce -- their one-time son- or daughter-in-law -- it’s all too easy for the custodial parent to curtail contact between them and their grandchildren. California Family Code Sections 3102, 3103 and 3104 allow grandparents some ability to override this and petition for visitation, but they must take proactive steps. A right to visitation is not automatic. The easiest way to exercise your right to visitation with your grandchildren is to get involved with your child’s divorce in the very beginning. Section 3103 of the California Family Code allows grandparents to do this by filing a “petition for joinder” after their child or his spouse has filed for divorce, but before the court grants the divorce. California has a mandatory six-month waiting period for divorce after one spouse files and serves her spouse with her papers, so you have at least half a year to file a petition for joinder. The petition asks the court to legally make you a party to your child's divorce case. The court will schedule a hearing, and if the judge approves your request, this gives you the right to file a second petition for visitation. After you do so, even if your child and his spouse reach a settlement agreement regarding all other aspects of their divorce, the court can't grant their divorce until a court hears and decides your request for visitation. If you miss the deadline for filing for visitation before your child’s divorce is final, you still have rights. Section 3104 of the California Family Code allows you to file a petition specifically for grandparent visitation post-divorce. This essentially creates a separate lawsuit all your own. The court will schedule a hearing to determine if it is in your grandchildren’s best interests to continue contact with you. Your grandchildren’s parents have the right to appear and argue against visitation. In legal terms, they’re your “adversaries” in this situation. They’re the individuals you’ve filed your petition against. This is true even if your son or daughter supports your bid for visitation. Your child would still be your adversary, but would not formally object to your request. If either your child or his spouse have remarried, your grandchildren's stepparents may be parties to a post-divorce action as well. A separate section of the California Family Code -- Section 3102 -- applies if one of your grandchildren’s parents is deceased. In this case, California law automatically gives sole custody of the children to the surviving parent, even if the deceased parent had sole legal and physical custody before her death, and even if the surviving parent has not exercised visitation with his children or remained a part of their lives. 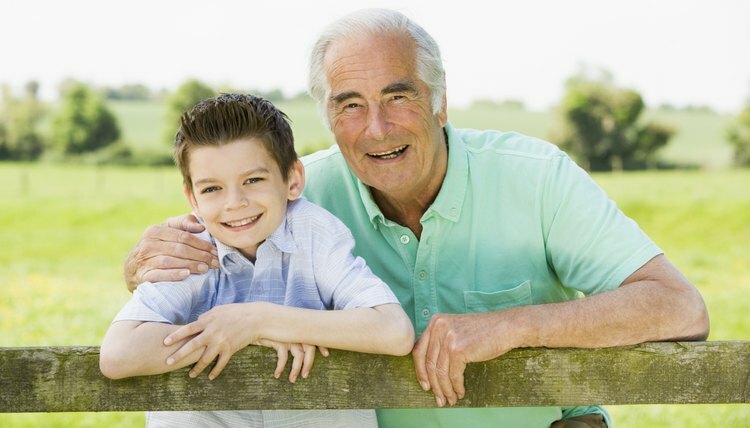 If your child is the surviving parent, and if you have a good relationship with him, you can probably presume that your time with your grandchildren will continue. However, if your child dies, and his ex does not want you to see your grandchildren after custody is transferred to her, you’d have to file for grandparents’ visitation under Section 3102 of the Family Code. You can also file a petition for custody if you feel your grandchildren’s other parent is unfit to raise them. However, the law usually presumes otherwise, so you might have an uphill battle if their surviving parent objects. If your child is still married to your grandchildren’s other parent, your odds of successfully petitioning for visitation decrease. The California Court of Appeals handed down a decision in 1996 in the case of Barkaloff v. Woodward, indicating that the court has the right to award visitation, over parental objection, to a non-parent who has an interest in the well-being of a child. However, the U.S. Constitution trumps this to a great extent. Under the 14th Amendment, parents have a fundamental constitutional right to raise their children as they see fit, without interference from the government. State courts cannot take away that right, absent egregious circumstances such as abuse. Therefore, if your child is married and if he and your grandchildren’s other parent decide that you should not visit with your grandchildren, a court is very unlikely to override their decision.This isn’t to say you can’t possibly win a lawsuit to achieve visitation, but you would probably need expert legal help in the form of an attorney who specializes in such cases. Virginia recognizes that it can be very important for a child to maintain ties with both parents even after the parents split up, so Virginia courts can enter orders allowing visitation rights. Since circumstances may change after a visitation order is entered, courts can also modify existing orders to suit the new situation if a modification is in the best interests of the child.